A Burkinabe police officer with the Special Intervention Unit fires his AK-47 rifle during a simulated terrorist attack as part of exercise Flintlock 2019 in Ouagadougou, Burkina Faso, Feb. 27, 2019. The United States and its allies are not winning the counterterrorism war for the Sahel, the head of U.S. special operations forces in Africa told VOA Thursday. “I would tell you at this time, we are not winning,” U.S. Air Force Maj. Gen. Marcus Hicks, the head of U.S. Special Operations Command Africa, said Thursday on the sidelines of Flintlock, a major U.S.-led military exercise in the region. 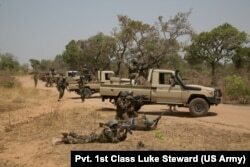 The exercise involves about 2,000 commandoes from more than 30 African and Western countries. 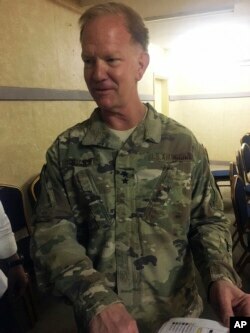 Maj. Gen. Marcus Hicks, U.S. military's special operations commander in Africa, is interviewed by the Associated Press in Niamey, Niger, April 11, 2018. The host of this year’s exercise, Burkina Faso, is battling an insurgency from several al-Qaida-linked groups, particularly in the past several months. The U.N. said last week that more than 100,000 people in Burkino Faso have been displaced by violence, and the country’s education minister has said more than 150,000 children are not going to school because of the jihadist threat. To counter that threat, the United States Embassy in Burkina Faso is expanding the amount of resources applied to the security problem and the amount of resources allocated toward supporting equitable economic development. “We have asked for resources, and the resources have been provided to us to accomplish the mission,” Young said. U.S. Africa Command has increased financial support of the G5 Sahel Joint Force, troops from Burkina Faso, Mali, Chad, Niger and Mauritania who patrol together against militant fighters, to nearly $111 million. Young said Burkina Faso has received $30 million of those funds. He said he “would not recommend more drones or more advisers” at this time, but he wouldn’t advise reducing U.S. troop numbers in the region, either. “We’re trying to avoid as much as possible the kinetic activity that could eventually disenfranchised the people from the legitimate government,” Hicks said. Nigerien soldiers respond to an ambush during training at Exercise Flintlock 2019 near Po, Burkina Faso, Feb. 26, 2019. The general’s recommendation to no longer decrease U.S. troop numbers in West Africa comes after the Pentagon ordered a 10 percent cut to U.S. defense personnel in Africa, effective over the next few years. The shift supported the administration’s new focus away from counterterrorism toward strategic competition with China and Russia, and the first U.S. military cuts on the continent pulled between 100-200 from West Africa. U.S. military officials have not revealed where future troop cuts will hit. Terrorist threats plaguing the Sahel have continued to spread. While the exercise participants took on a simulated threat, officers from Burkina Faso periodically left the training exercise to check in on troops carrying out a combat mission. Niger and Mali are fighting al-Qaida-linked militants, and Chad is combating a militant push from the expansion of Islamic State and Boko Haram in neighboring Nigeria. But as of early Thursday, Hicks said he had not received a request for additional funding, troops or equipment during this month’s military exercise. “Nobody’s asked me for anything since I’ve been here,” Hicks told VOA, adding that African partners have shown great appreciation for current U.S. support. Col. Nathan Prussian, commander of the Army’s 3rd Special Forces Group, told VOA that partners in the region have sought better equipment and help with logistics and coordinating operations. “No partner has come to me and said, ‘I need you to be on the ground with me on every operation I do,’” Prussian said. Burkinabe soldiers guard a terrorist during a simulated terrorist attack in Ouagadougou, Burkina Faso, Feb. 27, 2019, during Flintlock 2019. 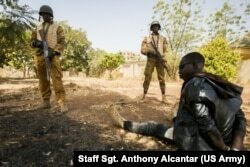 The Burkinabe army was responsible for cordoning off the surrounding area and securing any surviving terrorists. The Flintlock 2019 exercise focuses not just on tactical skills, such as shooting or formations, but also on military operational skills. Army Col. Max Krupp, the Special Operations Command Africa senior mentor, is serving as an adviser at the command headquarters in Camp Zagre on the outskirts of Ouagadougou. Commandoes there collected intelligence and battle updates from several military outposts in Burkina Faso and one outpost in Mauritania as part of a simulated operation. “Special operations forces may be able to shoot, communicate and move in the areas in which they are assigned, but without the ability to command and control them and understand the benefit and how it ties into the larger picture, our energies are best focused at the higher operational and strategic level,” he said.